Another month. The leaves are changing, Halloween is behind us, and I have officially ate way too much Halloween candy! My wife and I love the fall season and even had a chance to go apple picking before the weather was too cold and make some fantastic desserts with our haul. But that’s not the point of this article, is it? Each month, we like to summarize our results and check out the growth and progress we are making in terms of dividend income. Lanny kicked off the festivities by announcing a very nice 10.96% increase compared to last year. Let’s see how well I can perform. Here is my October Dividend Income summary! Fall is here, the leaves are changing colors, and we are closing in on the end of a pretty darn exciting month in the market. For the first time in a while, Mr. Market experienced wild swings and presented dividend growth investors with some pretty strong opportunities. The two of us have definitely taken advantage of a few of them, that’s for sure. With the turning calendar, comes the next installment in our “Expected Dividend Increases” series! For those of you that are new to the blog, each month we summarize a listing of companies that are expected to announce dividend increases in the coming month. Since we love following each company’s dividend increase closely, we thought we would share some of the excitement with you. Now, here are the companies expected to announce dividend increases in November! At the end of my September dividend income summary article, I mentioned that I was extremely motivated and excited to purchase some stocks in October. Shortly after, I put together a watch list identifying four dividend stocks that were on my radar. It did not take long for me to put some capital to work with some of the stocks on this watch list. When a stock price falls after you add it to your watch list, how could you say no? These purchases were small and frequent due to our free trade credits from Ally Investing, so there will be a few different stocks in this article. Here are the stocks I have been purchasing over the last couple of weeks! Wow. It is the fourth quarter already. It is hard to believe that the calendar is about to turn and the leaves are about to change colors. With a new month at hand, you know that means…another installment of our expected dividend increases series. 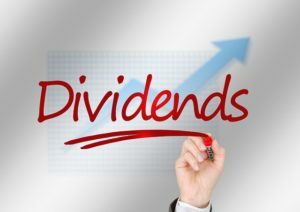 For those of you that are new to the blog, each month we summarize a listing of companies that are expected to announce dividend increases in the coming month. The two of us LOVE dividend increases. So we thought we would share some of the excitement with you. Now, here are the companies expected to announce dividend increases in October!